We have a new release with more new and updated features and of course lots more bug fixes that have been done over the past week. This again is a patch release to cover the gap between here and the new Vegetation system and improvements to the terrain system. So hopefully you will get to see some new stuff soon! New: Resource Remapper: Skip all button has been added to skip all overwrites so you can see the level without changing everything or skipping each remap individually. This will however make skyline use the Default Global Group to get the resources and may lead to the wrong asset being used or shown. New: Resource Remapper: The image of the asset will now show in the remapper to help you know which one is which. Updated: Action Editor: Removing an action while multiselected will remove that action from all the entities. Updated: Action Editor: Adding an action while multiple are selected will add the action all all selected entities instead of the last selected. Updated: Terrain Editor: Paint tab was slow as it converted the terrain texture every time the layer was paint changes. Now it uses the cache folder to return the path. Updated: Game Objects: Terrain Presets now are alot smoother for stepping between when the textures are added to the panel as it uses the cached images. Updated: Mesh Editor: The properties for the position, rotation, scale etc.. were not being reset when the mesh was changed and forced the user to update the properties manually otherwise it could muck the mesh up when saved. Fixed: When using a project, the resources for the other libraries would be copied from the file lists iand then when a folder was clicked on, it would add the folder to resources and cause a library write file which resulted in a list of duplicated assets, this would happen every time a project was opened or a scene opened and then caused issues with the remapper. Fixed: When Multi selecting models and change the mesh that they are all using, it did not write the resource groups and material data back to all the entities apart from the last selected one. Fixed: Sometimes when loading a mesh and the remapper appears for the material, it did not show what mesh the material belonged to in the dialog. Fixed: Loading a mesh ini file had a parse function error. 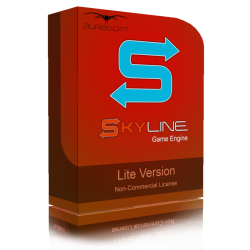 Fixed: Adding script from file or creating new script would default skyline to the System Library Scripts, rather than your user libary. Fixed: Multiselecting and adding actions to 2 or more entities while each have an external script attached will make the properties offset incorrectly and cause an issue with the entity. Fixed: Terrain: When changing the terrain textures, it was not removing them correctly from the texture array and would eventually crash. Fixed: Vehicles would fail setting certain wheel pararmeters due to a check system which was no allowing it through unless the wheels were created first, however, when setting wheel radius, the wheels are not yet created and need the properties sent. Fixed: Material Editor: Editing the depth bias constant or slop multiple times then turn on double sided would cause the editor to hard crash. 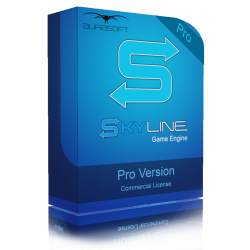 please tell me how to download skyline 3D game engine? ?